Welcome to the Redlin Art Center. 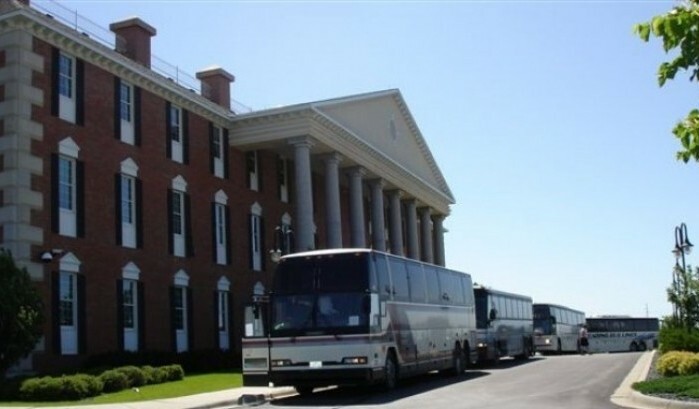 Many groups join us every year to enjoy the Redlin Center together: school groups, motorcoach tours, corporate receptions, reunion groups, birthday parties, anniversary celebrations, and more. Our knowledgeable staff are here to help you create an experience everyone in your group will enjoy. The following information is designed to help you make sure things go smoothly for your group. The Redlin Art Center can accommodate student and adult groups of all sizes when planned in advance. If you’re visiting with 10 or more people, we are happy to arrange a group tour. We custom tailor itineraries based on your group’s interests. The Gallery tour: Have a Redlin Art Center representative guide you through the Gallery, highlighting details only a true Redlin expert would know. We also offer a brief question and answer session too! Video presentations: Listen to Terry Redlin tell stories from his past or learn more about two of his famous series of paintings in four short featured films. See one or all four. Visit our Amphitheater page to read the full video descriptions. Outdoor exploration: Plan a walk in Conservation Park and watch nature come to life. Terry Redlin designed the Park to attract wildlife so others might be inspired by nature’s canvas. The Redlin Gift Shop: Save time for our Gift Shop. Browse Redlin prints, home decor, and other keepsakes. Sales at the Redlin Gift Shop directly support the operation of the gallery. We want your group to have a successful visit. Please share the following information with your group members in advance. NO food or beverage allowed in the galleries. NO unnecessary use of the elevators. School groups: Our objective is to enhance every student’s awareness of the arts. Plan 1–2 hours for your visit, which includes a video presentation, gallery visit, and gallery activities. Bus parking: Buses may load and unload at the front door. Oversized vehicle parking is available on the Northwest side of the building. Handicapped access: Elevators are located on each floor of the Redlin Art Center in the center rear. All restrooms are ADA approved. We recommend booking your group tour at least two weeks in advance. Ready to make the trip? Fill out our online booking form, or contact the Redlin Center by phone toll-free at 1-877-873-3546.